My television producer Rachel Purnell told me about having eaten a white pizza with arugula in London and I thought, "What a great idea!" 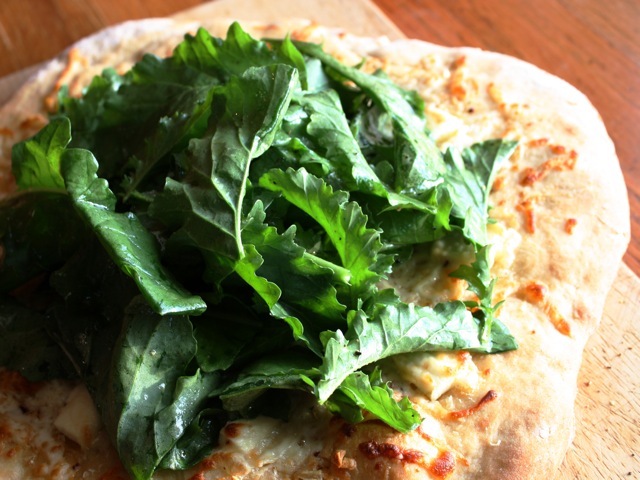 I love the interplay of the hot, crisp pizza with the cold lemony arugula salad on top. I finish it with coarse sea salt just before serving. You'll need three sheet pans to bake all the pizzas at the same time. Make the dough: Combine the water, yeast, honey, and olive oil in the bowl of an electric mixer fitted with a dough hook. When the yeast is dissolved, add 3 cups of the flour, then the kosher salt, and mix on medium-low speed. While mixing, add up to 1 more cup of flour, or just enough to make a soft dough. Knead the dough for about 10 minutes or until smooth, sprinkling it with extra flour as necessary to keep it from sticking to the bowl. When the dough is ready, turn it out onto a floured board and knead it by hand a dozen times. It should be smooth and elastic. Place the dough in a well-oiled bowl and turn it to cover it lightly with oil. Cover the bowl with a kitchen towel and allow the dough to rise at room temperature for 30 minutes. Make the garlic oil: Place the olive oil, garlic, thyme, and red-pepper flakes in a small saucepan and bring to a simmer over low heat. Cook for 10 minutes, making sure the garlic doesn't burn. Set aside. Press and stretch each ball into an 8-inch circle and place 2 circles on each parchment-lined sheet pan. Brush the pizzas with the garlic oil and sprinkle each one liberally with salt and pepper. Sprinkle the pizzas evenly with Fontina, mozzarella, and goat cheese. Drizzle each pizza with 1 Tbsp. more of the garlic oil and place them on baking sheets sprinkled with cornmeal. Bake for 10 to 15 minutes, until the crusts are crisp and the cheeses begin to brown. Make the salad: While the pizzas are baking, make a vinaigrette by whisking together the olive oil, lemon juice, salt, and pepper. When the pizzas are done, place the arugula in a large bowl and toss with just enough lemon vinaigrette to moisten. Assemble the dish: Place a large bunch of dressed arugula on each pizza and serve immediately. Culinate editor's note: The dough recipe here is the same as in Pissaladière, and each recipe makes enough dough for two pizzas. So if you like, enjoy the flavors of both pizzas by making one full batch of dough but two half-recipes for the toppings.